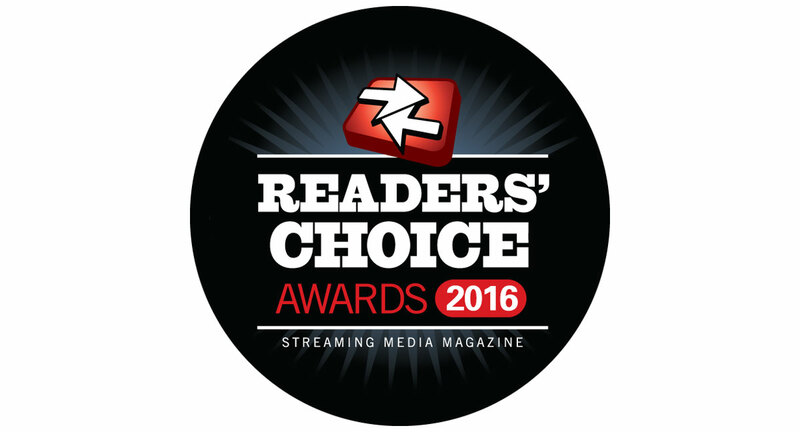 Today we begin accepting nominations for the 2016 Streaming Media Readers' Choice Awards. It's the only awards program in which the winners are decided by the people who matter most—you, the end users. This year we're featuring 36 categories, as detailed below, including new categories for end-to-end workflow, QoE/QoS, PTZ camera, video player, and VR/360° camera. Anyone, including vendors themselves, can make nominations, and only one nomination is necessary for a given product or service. We will only accept one nomination per company per category; in some cases, it may make more sense to nominate a product line than a single product. Our editorial team will evaluate all the nominations and then announce the final nominations when voting begins. Nominations open today, July 8, and run until August 8. Once we've had a chance to sort through your recommendations we'll open award voting on (or around) August 15. In a change from previous years, companies will not be able to solicit their employees to vote for their nominees; we don't want this contest to be decided based on the number of employees a company has. Voting will conclude on September 26. In October we'll announce the finalists—the top three vote-getters in each category. The winners will be announced November 18 at Streaming Media West, which once again is being held at the Hyatt Regency Huntington Beach Resort and Spa in Huntington Beach, California. This year's awards are sponsored by LiveU and Teradek. Winners will be featured in an article in Streaming Media magazine and StreamingMedia.com, as well as our Streaming Media Xtra newsletter. If you'd like to see what companies took home the Streaming Media Readers' Choice Award in 2015, look to our list of winners. Last year we received more than 35,000 votes from more than 3,500 voters for 249 nominees in 29 categories. We can't do this without you, so please think about what companies are doing outstanding work and make your nominations. The categories below are listed in alphabetical order. Today's capture hardware is more robust and powerful than ever before. Which one is offers the most bang for the buck? Presenting a useful way to broadcast from the field, cellular bonding solutions have taken off for live or on-demand coverage. Closed captioning isn't just a good idea; in many cases, it's the law. Making it simple and accurate is crucial. Who's got the best SaaS for encoding and transcoding video, in terms of quality, turnaround time, and service? This category covers both telco and traditional content delivery networks. These solutions use metadata, speech and facial recognition, or other methods to help users easily find the video they're looking for or to discover recommendations based on their personal information. It's more important than ever for premium content owners to protect their content on every possible device, necessitating a multi-DRM approach. Which DRM service provider offers the best experience for the content owner and the consumer? Educational institutions have unique requirements and face distinct challenges when it comes to publishing video. Which video platform works best for schools and universities? This category is for hardware encoders specifically designed for live encoding. What's the best hardware designed for on-demand (non-live) encoding? We're combining the desktop and enterprise-class encoding categories this year, as we search for the best overall encoding software. When a content owner, whether entertainment or enterprise, is looking for a soup-to-nuts video workflow solution that includes professional services and consulting, these are the service providers they turn to. When large organizations look to create their own internal YouTube or other company-wide video solution, this is the platform they should look to first. Field recorders, camera-attached or otherwise, play a critical role in video production when you need to archive a high-quality feed for editing and on-demand delivery. And whether you’re shooting in bright, outdoor sunlight or trying to match images from different cameras, portable HD or 4K field monitors can be critical for reliably delivering quality shots. Which combination field recorder/monitor does the job best? Which live streaming platform leads the way in terms of features, functionality, and usability? Recognizing the best hardware or software solution for delivering audio and video files to listeners and viewers, regardless of delivery protocol. The audience is global, so choose a solution that can overcome language barriers with translation, subtitles, and closed captioning. As MSOs and MVPDs deliver more over-the-top content, they're looking to more robust and functional solutions than traditional media and entertainment video platforms can offer. These portable appliances do it all—switch, mix, title/overlay, and stream—from virtually anywhere; this year, we've broken the category in two based on price. More and more video productions are using PTZ and network-controlled cameras in their multi-camera shoots. Which one leads the pack? You need to ensure that your content is getting to your viewers in the highest quality possible, in terms of both the network and the end user. These solutions help you gauge and improve QoS, QoE, or both. When a business needs a video platform with functionality beyond YouTube, but isn't looking for a full enterprise or OTT solution, these are the platforms they turn to. Want to provide seamless ad delivery on the mobile web and stop ad blockers? These are the solutions that help you do it. Who offers the best solution for transparent caching of video content on a delivery network? It all starts with the camera, and this year we've broken into two categories by price. Video optimization helps content owners reduce file sizes with little or no sacrifice in image quality. Viewers demand broadcast quality in live online video events, and these units make it possible, handling switching, mixing, overlaying, and keying (but not streaming). Again, we've separated this category in two based on price. VR/360° video is the next big thing, and streaming producers and content owners are committing to it now. Which cameras and camera rigs offer the best VR capture capabilities today? These in-house solutions capture video and audio, combine it with slides and images, and deliver it to online viewers in an interactive environment with Q&A, surveys, and more. Webcasting and presentations are a big area this year, so we've broken the category into local and cloud solutions. Today's compact wireless transmitters deliver live HD video from wherever you are to wherever your audience is via popular streaming platforms. Which transmitter rises above the rest?